Bud, Call Ken at Old World distributors @ 269-372-3916. If you take it off and make exact templates out of tar paper of each of the sides, and also give him cross measurements from point to point, he can make it up for you and send it out to you. I am sure that someone over there could do it too, but I have worked with Ken for years and they are very good. Good luck! The advantage of doing it this way is that you get to see how they did it when you take it apart, so putting it back together is not so daunting; if you haven't done it before. Sorry don't think it will be worth your money for me to come down. E-mail direct if want a estimate. Roof is not compromised, just dented. Need to complete to close insurance claim. Insurance company has no numbers to compare to, they are willing to take a contract price for the job. 2 windows, both are the same. Are they big, got any picture. Are you replaceing them, whats the time line??? Sorry, I know it's not slate but I thought I would get the most eyes here. 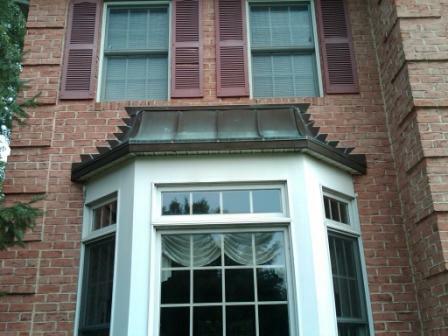 Hail damage to two copper roofs over bay windows, ties into brick. Can anyone help me with this one, located in central PA. Willing to assist for the experience.